At first sight was the “all that grey ” limited edition nothing for me! 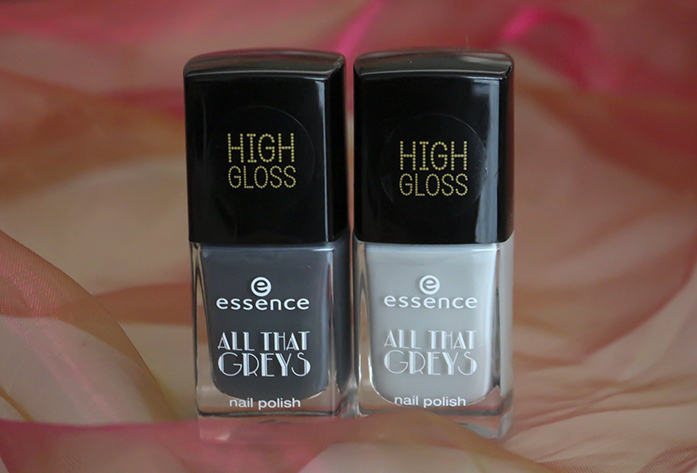 But when I saw this collection from essence in real, I was directly sold to two nail polish. Normally I’m not fan of grey nail polish. But these two looked so pretty! And of course they are way to pretty! So let’s tell you more about these products! Greyt Times is a light, sweet grey color. You need two till three coats. I’m wearing this color right now and I’m fan! It’s a good nail polish, you only need two coats and with a top coat it stays for three days! So I find this very good for a polish from essence! This is the perfect color for winter and spring. It’s a medium/light grey creamy polish with a glossy finish. The next color is step into the grey zone. This one is dark grey with a cold/blue undertone. You need two coat of this polish. It’s also a creamy polish with a beautiful glossy finish. Unfortunately step into the grey zone don’t dry that fast… So you need a little patient with this one! But even tough that this is my favorite one! My favorite is of course step into the grey zone! I just love this color so much! You can buy this limed edition at the drugstore. They cost €1,99 each! Ik vind het onderste lakje het mooiste. Mooie lakjes zijn het wel. Die laatste vind ik mooooi! Ben helemaal in the mood voor grijze nagellak! Waarschijnlijk door het grijze weer momenteel..
Hehe, ja ik vrees er voor! Maar die laatste is inderdaad erg mooi!